Happy Mayan Calender End-of-the-World day. As promised, we haven't gotten a lot done on the Locost this past week. 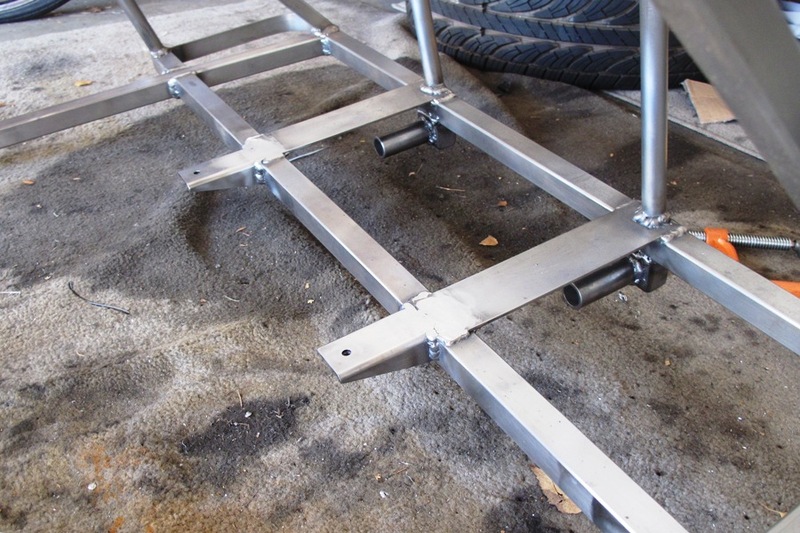 We're still waiting for the roll bar, which is okay since we wouldn't have had time to install it. 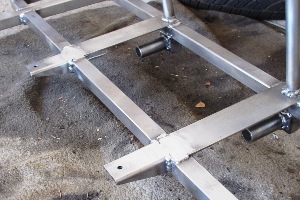 We did some tinkering on the car though, and got everything else done on the chassis, or what seems like everything else, at least until we discover whatever it is we've missed. Or the world ends, whichever comes first. 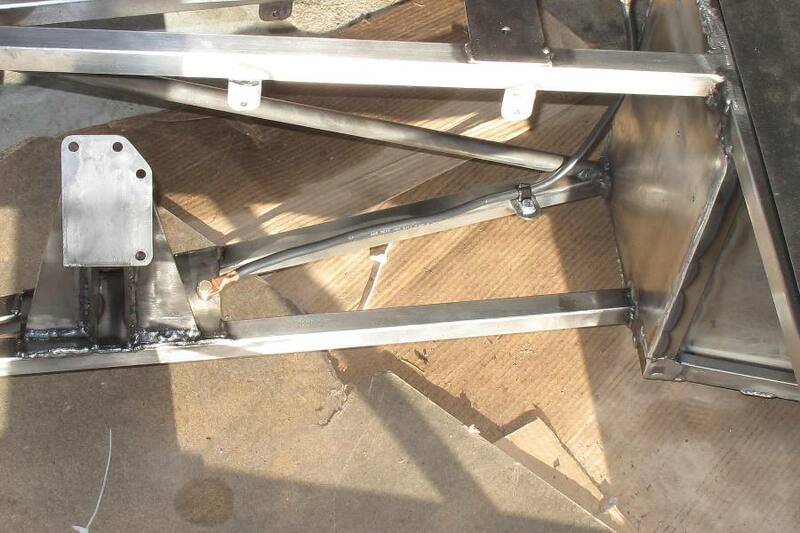 We extended the fuel tank mounts three inches out. Now we'll be able to strap down our 9" wide Jaz Products fuel cell with room to spare. 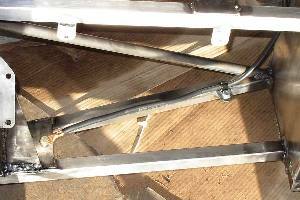 In a rare display of common sense, we installed the Panhard rod just to make sure we had enough clearance. 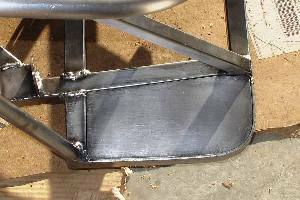 It turns out the Panhard rod bottoms out on the frame right before it makes contact the fuel tank support, which is perfect. We haven't made the straps yet and we don't have our fuel tank, but we have the measurements and we're confident like always that everything will fit. Incredibly, we may be all done making tabs. On Saturday we welded what we think is our last one, a tab for the battery ground cable. We're running the cable to the nearside engine mount, which we drilled for a 5/16" bolt and then welded on a nut underneath. The total number of tabs on our car now comes to 46, which is about 44 more than we originally planned, but the good news is that with all of these tabs our electrical system will now be completely ready to install once we get the frame painted. Speaking of which, we're rethinking our idea of coating the frame with POR-15. We did some research and it sounds like it's not universally loved. A few people even call it snake oil. My own thoughts are that it probably does work as advertized, but has a few idiosyncrasies that turn some people off, like lack of adhesion. Which probably isn't even a real problem if you prepare the frame perfectly, and use POR's frame cleaner, metal prep, tiecoat primer, and probably several other expensive POR products. We already bought the POR-15 and the metal prep, but looking at all the other stuff we'd have to buy to do the job right, we're thinking we'd probably have more luck with regular automotive etching primer and a nice acrylic enamel. We'd also probably save a few bucks. The thing is, POR-15 is really more for painting over rust (hence the name, POR), and less for rust-proofing fresh clean metal. So maybe we'll save the POR for the wheels, which are unlikely to ever be rust-free again. In the even-more-encouraging news department, I think we welded some bad metal. We ordered some cold roll 1/8" steel plate to use as a base for our rear roll bar supports, and we didn't notice right away that it didn't have its usual smooth gray surface. So we cut a piece from it, filed the edges to shape, and welded it to the car. 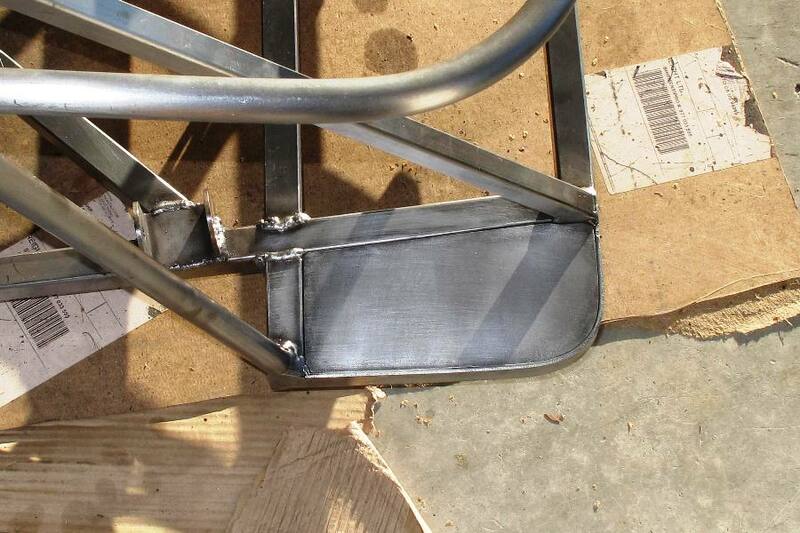 It seemed to weld just fine, but when we wire brushed the piece afterwards we noticed a white powder in the air. Then we realized the surface wasn't smooth, but had some kind of rough plating. I'm guessing zinc. Now I'm wondering if we should've welded it at all. 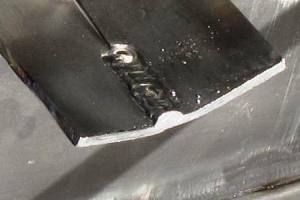 For one thing, plated metal doesn't always weld all that well, unless you grind it first. The plating acts as a kind of heat barrier that keeps the metal from melting, although I don't think that's an issue with our welds because we can see the melted metal on the other side of the plate. 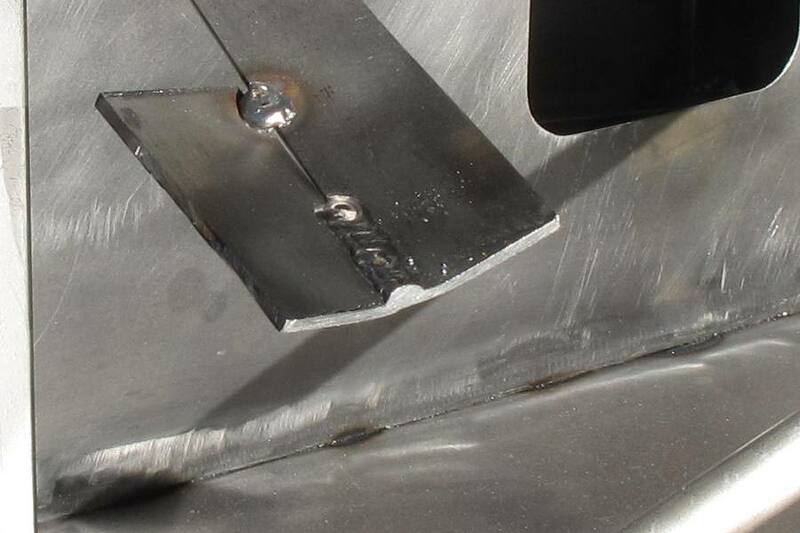 Just to be sure we ran a test bead on a couple of scraps, and then cut the piece in half across the weld bead. The metal definitely melted all the way through. So I think we're covered there. But the biggest problem with welding plated metal is that zinc gives off noxious fumes when it's heated. Not noxious as in fatal (we hope), but according to Wikipedia, enough to give you the dreaded metal fume fever. It's supposed to take 24-48 hours for symptoms to appear, so I guess we'll know in a couple of days. If we end up with flu-like symptoms, at least we'll have the satisfaction of knowing the part won't rust.